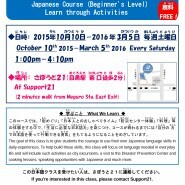 Japanese Course (Beginner’s Level) starts soon at Support 21 Social Welfare Foundation, sponsored by Agency for Cultural Affairs. The goal of this class is to give students the courage to use their own Japanese language skills in daily experiences. 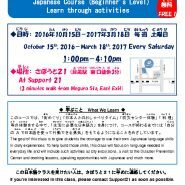 To help build those skills, this class will focus on language needed in everyday life and will include such activities as city excursions, a visit to the Disaster Prevention Center and a waste processing center, cooking lessons, speaking opportunities with Japanese and much more. ■If you’re interested in this class, please contact us by Mai 14, 2016.